Mapei’s family of lightweight cementitious adhesives has been developed for bonding all types and sizes of ceramic, mosaic, natural stone and thin porcelain tiles on interior and exterior surfaces. The excellent deformability of the adhesives, in compliance with the European Standards EN 12004, compensates for any movements of the substrate, thermal expansions or dimensional changes, avoiding the detachment of the tiles. Ultralite S1 is a one-component, high-performance, lightweight cementitious adhesive with extended open time, no vertical slip and low dust technology, which reduces the formation of dust during mixing, and a very low emission level of volatile organic compounds (VOCs). Thanks to its S1 Class deformability, it has a good capability to neutralise movements of the substrate and dimensional variations, hence avoiding the detachment of the tiles. With a 60% higher yield than other adhesives with the same classification, one 15kg bag can tile the same surface area as a 25kg bag of traditional adhesive. It allows all types of ceramic, including thin tiles and mosaic, to be overlaid and bonded rapidly on all types of traditional substrate, heated floors, plasterboard, external facades and more, and is particularly recommended for overlaying with medium to large size porcelain tiles. Ultralite S2 is a one-component, high-performance, highly deformable, lightweight cementitious adhesive with extended open time and a very low emission level of volatile organic compounds, with an 80% yield higher than Mapei S2 Class two-component cementitious adhesives. With a transversal deformability higher than 5mm, Ultralite S2 has an excellent capacity of absorbing deformations in the substrates, thermal changes or dimensional variations in the tiles, hence avoiding their detachment. It is the only one-component, highly deformable (class S2) adhesive according to EN 12004 standards – there is no need to add latex, instead it can just be mixed with water. Ultralite S2 keeps its creamy consistency and ease of application at higher temperatures compared with two-component adhesives with the same classification. • Thanks to their special formulation, work feels less tiring, while the glass microspheres or natural aggregates contained in the adhesive help to make trowelling easier. • Lighter bags (15kg) with a practical hand grip for easier handling. • Excellent back-buttering, double-buttering not required. 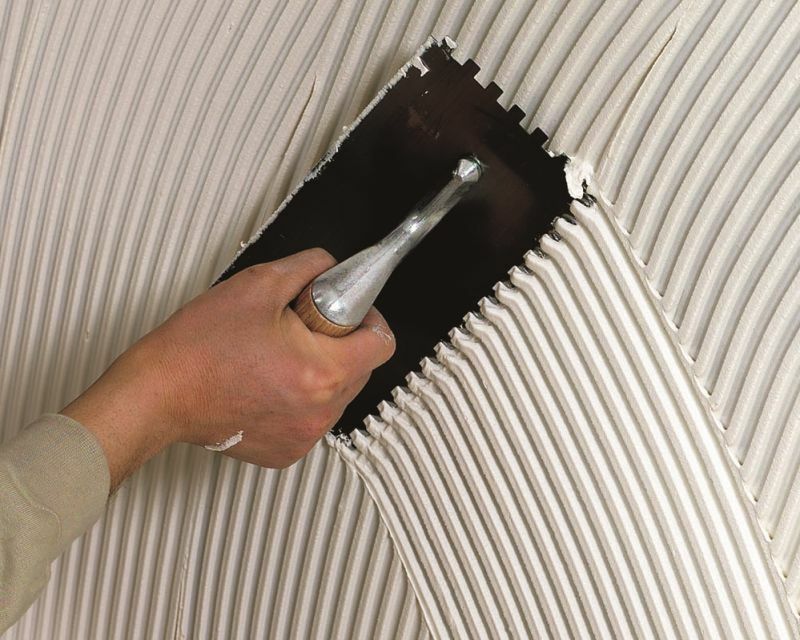 • Perfect adhesion to all types of substrate normally used in the building industry. • Contain more than 20% of recycled materials.